It see ms like every day there is a new headline highlighting the issues that our southern neighbors are facing after the US elections results. Social media has become a boxing ring between Trump supporters and non-supporters, each side delivering a blow that stings as much as the last. With an estimated 900,000 to 2 million US citizens living in Canada[i] we must recognize our position as a neighbor and declared ally to the US. We must also recognize that we are not innocent ourselves. We have never elected a female Prime Minister, and our very nation has been built on cultural genocide. We cannot change the past, and it feels as though we may not be able to change the future as much as we had once thought…. Canada and the US are not quite as different as we like to think. Even though I raise my hand in class every time one of our professors asks who is American, and every time I go unnoticed, I am in fact American…. AmeriCanadian if you’d please. Going back to the US and spending the break there was a strange mixture of holiday cheer and utter shock. Although the election hit me hard while up in the land of my mother, I was not prepared for the emotional edifice that I was to face coming back. But, I am not going to make this post about my personal grief or stomach churning sensation I get every time the orange-faced you-know-what stands up as a representation of my country. In fact, it is actually difficult not to use the colorful-almost-made-up vocabulary I possess from my art history days to paint the portrait of a man who is so brilliantly portrayed on Saturday Night Live (if you have yet to see Alec Baldwin in his what I believe to be an Oscar worthy portrayal of the President Elect, click here). I am angry, I am offended, I am disgusted, but I am also optimistic, I believe in the common good and common decency of humanity despite that every time I open the ‘news’ app on my iPhone it is constantly tested. I commend everyone I know who has used their position to speak out against what has happened, I know multiple people who have written letters, marched in protest, and have actively spoken out on every social media platform. I also know people, people I love and admire, who voted for Trump. TO LISTEN: We do not need to become angry and shut out those we disagree with. We need to listen, we need to lead through our actions, we must maintain the values and cultures of our workplaces, social circles, educational arenas. This coupled with actively raising our voices against the injustices that have been committed as those who have been waiting to unleash their pent-up intolerances think that power has just been handed to them, is the fight that is our responsibility to stand up in. Regardless of who you support or did not support, regardless if you are American or not, this election has affected people worldwide and has instilled a sense of fear of what is to come. The culture of fear is a funny thing; it can paralyze or mobilize. 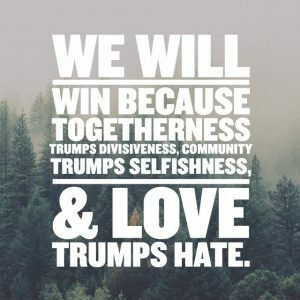 So for 2017 I have decided to listen, to speak, and to show that despite any individual’s political alliance, Love Trumps Hate. We mustn’t allow fear of others’ political views to destroy who we are as individuals, and as a community. This is an opportunity to fight harder, push further, and demonstrate that as Americans & Canadians living in a multi-cultural world, we are not innocent, but we can take hold of our futures. Listening and acting is where we can start. This entry was posted in Personal Profiles on MM Students and tagged Community, Social, Student Life. Bookmark the permalink.